The Director of Quantum of Solace – Marc Foster – brings us a zombie apocalypse movie that seems all to familiar, and all to different at the same time. Zombie films tend to follow the same narrative pattern; a virus breaks and an epidemic ensues, the major cities fall first, the supermarkets get ransacked and people hold up in their houses until a antidote is found. Also typically our central character is an authority figure that plays a pivotal role in finding a cure, and in World War Z there is no change. 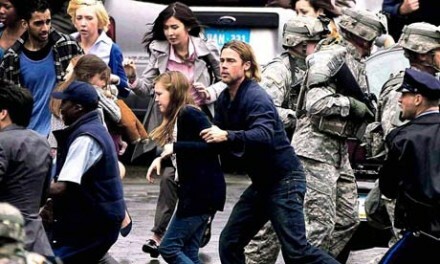 Gerry Lane (Brad Pitt) is an ex United Nations employee, that left his post so that he could be closer to his family. When the epidemic hits him and family are on the frontline, so he calls upon his old friends to take him and his family to safety. But they have not rescued him as a gesture of kindness; they require Gerry to travel across the globe in search for the root cause of the outbreak. What breaks the cliché of conventional zombie movies is that we rarely (if ever) see the zombies chowing down on their victims – that and they are the running type of monsters, reminiscent of the type of undead we saw in 28 days later, rather than the shuffling type we are use to. Adapted from the book by filmmaker Mel Brooks son, Max, about a zombie apocalypse told from the perspective of the survivors. This adaptation was surrounded by controversy even before a single frame had been shot. Damon Lindelof was drafted in to rewrite the final act of the screenplay written by Matthew Michael Carnahan and Drew Goddard, plus extensive reshoots had to happen in order to finish that act. At times the pacing is all over the place and for a horror film it plays it pretty safe – apart from a few scenes in the first act there’s hardly anything horrifying about it. Fans of the zombie genre will of course (if they haven’t already) be booking there tickets; but they will do well to remember that this not a low-budget gore-fest, and more a big budget spectacle.